And what a treat it is. A dish liberally filled with sausage, Parmesan and double cream – it doesn’t get much richer. For some strange reason this afternoon, I suddenly thought of this recipe in particular. It popped into my head and I knew straight away, I had to cook it. Right then and there…. I swiftly checked the recipe, wrote a short shopping list…. pulled on my trainers and walked determinedly off to the local shops to get the ingredients I needed. A lightning visit to the local butcher and greengrocer, and back I hurried, urgently swinging a carrier bag filled with ingredients. The interesting thing is, at least; to me, is that I’m writing this post as I actually cook it…. which is something of a first on this blog. It’s gently simmering away, out there in the kitchen, throwing out a rich scent of bubbling wine, onion, garlic and sausage meat…I’m in here in my, for want of a better word ‘study’…typing away and trying to judge correctly when to hurry back to give the pot a good stir so it doesn’t stick…nothing else to do for 45 minutes. The plan is – to get this written up, take photos, and have the post up and being read by you, whilst I lean back, belching lazily, patting my now full belly and swigging on a well earned, ice cold Peroni. 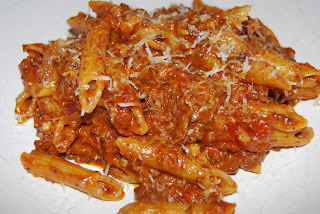 Its from the River Café cook book; and in Italian is Penne con Sugo di Salsiccie, or Penne with slow-cooked sausage sauce. 6-8 Italian spiced fresh pork sausages, meat removed from skins and crumbled (if you can’t get them easily – just use good quality pork sausages). 2 small red onions peeled and chopped. 2 garlic cloves, peeled and chopped. 2 small dried chillies, crumbled. 2x 400g tines peeled plum tomatoes, drained. Heat the oil in a large pan, and fry the sausage meat, stirring and breaking up the pieces. After the juice from the meat has evaporated and the fat begins to run, add the onion, garlic, chilli and bay leaves. Cook gently for almost 30 mins until the onions are brown. Pour in the wine, increase the heat and cook until the wine evaporates. Now add the tomatoes, lower the heat, and simmer gently until you have a thick sauce, about 45-60 minutes. Season with nutmeg and salt (and pepper, if the sausages were not spicy), and add the Parmesan and cream. Cook the penne in a generous amount of boiling salted water, and then drain well. Add the pasta to the sauce, combine and serve. 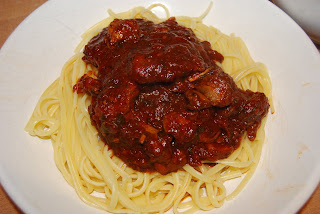 Utterly superb, and whilst I’m talking about incredible, slow cooked, unctuous, rich Italian pasta dishes, I tried this recipe earlier in the week by The Graphic Foodie, Red Pasta sauce with Pork. It’s an Italian family recipe, her Mothers in fact, and it’s without a doubt one of the best things I’ve cooked in ages. Incredibly good and rich, I suspect I’ll crave it sometime soon like I craved the recipe above. I urge you to give it a try, you won’t believe how good it is. I’ve finished just in time, I’m being distracted by the urgent ‘beeping’ of the timer from the kitchen; dinner is more or less, done. I'll quickly take pictures, (eternal curse of the food blogger – cold dinner)…. eat my food – and get this post up. Enjoy. The Seahorse, located in the incredibly picturesque town of Dartmouth makes good use of it’s position on the harbour front, a stones throw from the mouth of the river Dart, and from there, no more than a mile or two upriver, the English Channel where the moored Fishing boats, viewable from the restaurant ply their trade. Ensuring that, as primarily a seafood restaurant, it’s reputation is second to none. This is about as fresh as it gets. In addition, with the extremely well respected, self taught Chef, Mitch Tonks in the kitchen, of whom it could be said; knows just a thing or two about fish. Seafood lovers visiting the restaurant are in for a treat. A recent Giles Coren review raved about the food and the atmosphere, and with me being in Dartmouth for the weekend accompanied by ‘E’ and it being her Birthday, the choice of restaurant to celebrate the occasion was clear. Walking down the cobbled harbour front, along past the still waters of the Dart, on an unusually mild late February Saturday evening, and entering the rather smart balconied frontage of The Seahorse it all felt very right, soft ambient lighting, a very smart bistro vibe to the table layout, incredibly only open since April 2008, but feeling like it has been established for much, much longer. The dining room has that settled, lived in feeling, of real character. 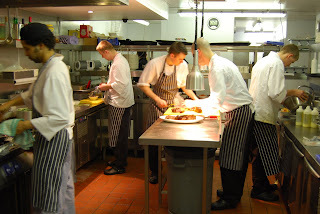 A large window at one end of the restaurant giving an interesting view onto the kitchen brigade, busy at their work. The Final piece of polish being a friendly greeting from the Maitre'd, perfectly pitched at professional politeness with none of that saccharine, forced bonhomie you often encounter. Taking our seats at the table, we were really very excited about the meal ahead, and decided to have a Prosecco cocktail aperitif whilst studying the menu and dipping the proffered bread in some smoked cod roe, very nice. 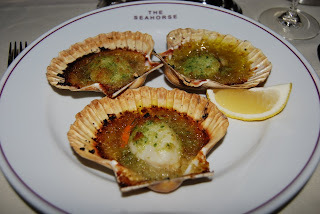 To start, I went for the Lyme Bay scallops with garlic and white port roasted in the shell over the charcoal fire, as Giles Coren had me salivating over them in his review. ‘E’ chose Oysters from Bigbury Bay. The scallops were incredible, rich, garlicky and succulent, with an almost toffee like consistency to the roasted garlic, port and breadcrumbs surrounding the meat. Seriously, I consider these to be one of the best things I’ve ever eaten. Delicious. 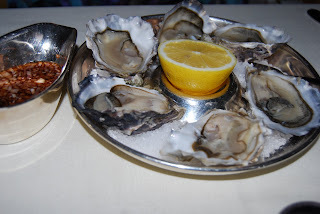 Across the table, ‘E’ was happily wading into her oysters. Served with a choice of lemon or shallot vinegar, I tried one, and it was superb, fresh and with that characteristic taste of the sea. Setup nicely for the main course, I went for Sea Bream cooked ‘al cartoccio’ (Roasted in paper, if you don’t know what it means…. I didn’t). With chilli, roasted garlic, rosemary and olive oil. 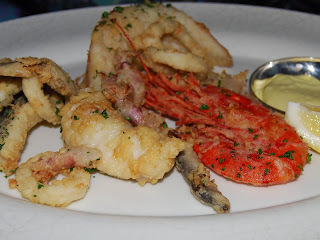 ‘E’ chose Fritto Misto, served with aioli, the smaller print underneath informing that this consisted of monkfish,john dory, red mullet, whitebait, carabineros prawn, squid and chiperones. So a veritable haul of seafood there then. With our mains, we ordered some sides of exceptional, buttery charlotte potatoes and roasted seasonal vegetables. 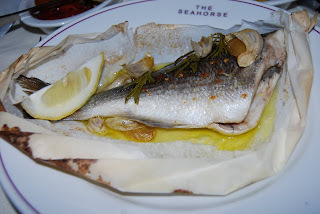 The Sea Bream was lovely, beautifully cooked and redolent with the perfume of the garlic and rosemary. Although, I couldn’t detect any chilli at all, despite poking around in the paper bag for a good few minutes… a little drunkenly by this stage, I might add. (We’d ordered a bottle of ‘Tonnix’ a white wine, which is the result of collaboration between Mark Hix and Mitch Tonks, it’s been produced to match well with seafood. It was very nice indeed, and did go perfectly with our food). Onto desserts, and this is where I made an uncharacteristic pudding slip up. 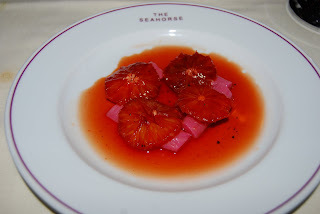 I went for Rhubarb and Blood Oranges with caramel and cardamom – expecting something a bit more substantial than what actually arrived…. I guess now, I think I was expecting some kind of crème caramel pudding with fruit…not a small plate of fruit in syrup. I was inconsolable…. I mean, it was nice…. but just not £5-50 nice. 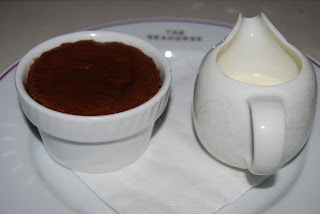 ‘E’ on the other hand had chosen more wisely, ordering a baked chocolate pudding…. I stared sadly at her stuffing this much more substantial dessert. Me, casting by turns desolate and envious looks across the table. Coffee slurped, and bill settled, we left the glowing confines of The Seahorse extremely happy with the meal we’d just eaten. The seafood is sublime, beautifully cooked and the restaurant itself exudes a certain cheerful atmosphere, which is infectious. It’s hard to put my finger on exactly what generates the happy vibe – but The Seahorse is obviously doing something very, very right. 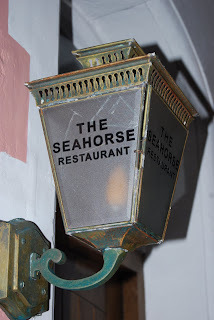 If you’re ever in this part of Devon, The Seahorse is a must visit. Last autumn, Polpo opened in the eye of a veritable hurricane of social media led positive publicity and superb heavyweight reviews. Here at casa Essex Eating, this didn’t go unnoticed. 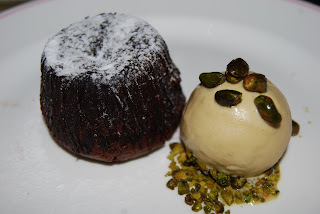 But, as one who is always fashionably late, (some might say painfully so), I must admit to being one of the few food bloggers left in London who had yet to visit…. that’s right, past tense ‘had’…. I’ve now been, and I’ve tried. (Err otherwise this would be a pretty rubbish review, non?). So sit back, read on and I’ll tell you about my visit. Polpo is unusual in London, insofar as it’s what’s known as a ‘bacaro’. 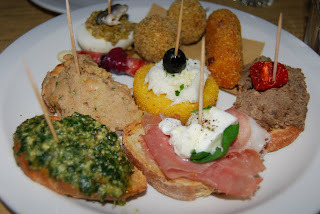 An eatery specific to Venice, it’s a form of working mans pub where small plates of snacks, known as Cicheti are served. Think Venetian tapas and you wouldn’t be far wrong. The restaurant is also unusual in another way. There is a ‘no booking’ policy in the evening, which I found to be quite refreshing – upon arriving, you can stand and have a drink at the bar whilst waiting for a table to be vacated, it’s all very pleasant and means that rather than plan an evening days in advance, you can just drop in on a whim. Superb. Arriving on a Saturday evening Polpo was visibly busy, buzzing and packed with the general hum of happy diners conversing. Making my way to the bar, I enquired about a table and was told, there would be up to a thirty-minute wait. Fair enough. Putting my name down on the waiting list, I ordered a Moretti, and “E”, my dining companion ordered a Campari spritz. (Which, she proclaimed to be excellent). Exactly eight minutes later, we were approached to tell us our table was ready. Not bad going at all on a Saturday night. Threading past the bar and other tables, through the beautifully distressed (white Victorian style tiles, exposed brick, bare light bulbs), into the extremely dimly lit restaurant proper, mood lighting with the emphasis very much on mood. Sitting down at a small table for two, it was cosy…. very cosy. Our neighbours being mere inches away. Looking down our table produced the optical illusion that made it appear, rather than sitting at individual tables, my fellow diners and I were sitting at a long communal table. Which is fine by me, in my opinion it all adds to the atmosphere. Ordering a carafe of wine to share, we quickly decided that as the ‘Cicheti’ section of the menu was so reasonable £1 - £2 per item, we’d order everything, the lot…. just to try it. Along with this, we ordered some rather nice bread, cured ham and split pea risotto from the Meat section. Mussels and clams from the Fish section, grilled zucchini and rocket salad from the vegetable section …it all looked so good…. at this point our waitress stopped us and said “Actually guys, I think that’s enough”. Foolishly we listened to her ill advised, but well-meant interruption and stopped ordering. After a short wait, up came our ordered Cichetti – all of it on one plate. White anchovy, tapenade and egg. Small but perfectly formed tasters - no more than a couple of bites each, most of the proffered snacks were seriously lovely, the Arancini in particular were superb, as was the chopped chicken liver. 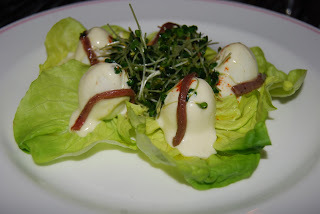 The white anchovy tapenade and egg, was a favourite of ‘E’ which in her opinion packed a real flavourful punch for such a small bite. I wasn’t keen on the Salami and pickled radicchio grissini, I couldn’t discern much apart from dry grissini to be honest. And the salt cod on grilled polenta consisted of tasteless salt cod on unpleasant fridge cold, grilled polenta, utterly bland due to being over chilled. But, despite a couple of duff Cichetti – there were many more hits than misses and both myself and ‘E’ were more than happy with what we’d tried. The larger plates we’d ordered arrived. 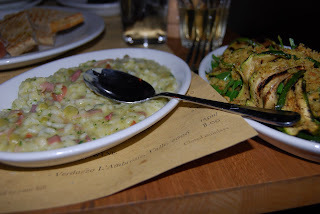 My cured ham and split pea risotto was incredibly good, unctuous and rich – exactly as a decent risotto should be. 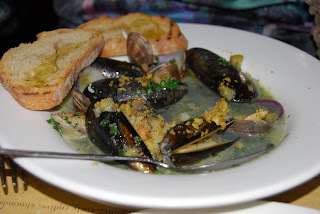 ‘E’s Mussels and Clams, were also excellent – with some incredibly large meaty Mussels filling the shells. From the vegetable section, the grilled zucchini and rocket salad was superb. Coated with fried breadcrumbs the whole dish was delicious. Ploughing our way through that lot, the waitresses earlier warning of our gluttony whilst ordering came back to haunt us, but probably not in the way she expected. We’d eaten everything ordered, were still hungry and could happily eat more. What to do? Order more savoury dishes or move onto the desserts…. and order three to share? 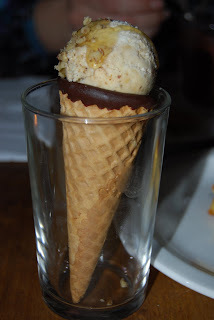 Honey and Walnut semifreddo arrived in a novel manner, scooped into an ice-cream cone. The initial taste was loaded with honey, but subsequently it was less flavoursome. It was the least successful of the three desserts we ordered. 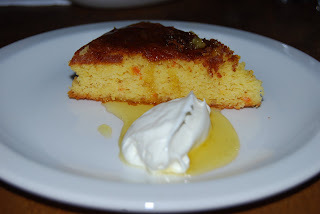 Flourless orange and Almond cake with mascarpone was altogether more pleasing, light, moist and tasting strongly of orange. Very nice indeed. 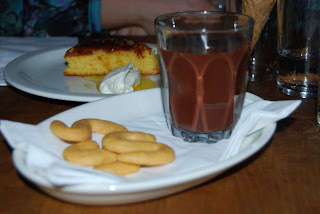 But, saving the best till last – the Hot Chocolate pot and ‘esse’ (Italian ‘s’ shaped biscuits), was gorgeous, so, so good. Rich, creamy and decadent. It was everything a good dessert should be. Coffee’s arrived, and at this point the needle zips across the record. My espresso was fine. ‘E’s Americano was bloody awful, so strong it was incredible, it tasted like the equivalent of six espressos…the accompanying small jug of milk wasn’t enough to dilute it to a drinkable level, we had to ask for more – and it was still barely drinkable. Not entirely sure what went wrong there. 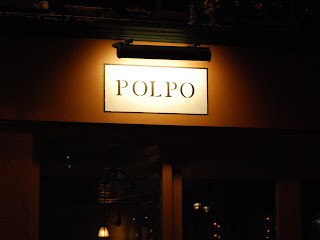 But, turgid coffee aside, I absolutely loved Polpo. I had a great meal and really enjoyed what I ate. I tried a lot of different food, with a lot of exciting different flavours and that’s the beauty of it. With small plates and portions, you can roam around the menu easily, a bit of this,... a bit of that. Perfect to share. Looking at the menu now, next time I visit (and there will be a next time), I’d order in a different manner – ignoring the Cicheti and perhaps ordering a couple of the main dishes with some of the vegetable side dishes. Sadly, I didn’t order the Cuttlefish in its ink, gremolata dish and there were collective groans of horror from foodies on Twitter upon hearing of this oversight, it being something of a signature dish. But, it gives me another reason to go back, so I’m not too put out. I’m a bit of a peasant when it comes to food, a product of my upbringing in Essex I guess. My tastes are drawn magnetically towards the unpretentious, the simply cooked and more often than I’d like to admit, the foodie gutter. (“Why yes my good man, chilli sauce on my kebab would be tip-top”). Which is perhaps why I love a good burger. 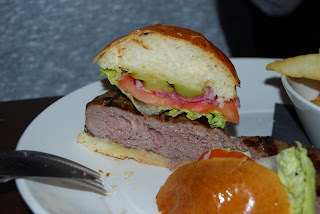 But, in complete contrast to my claims of peasant tastes, just to complicate matters… any old burger will not do…I like something a bit premium, a bit special. OK, I admit it…. a bit pretentious. 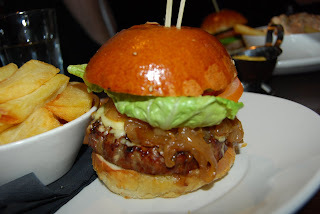 Regular readers of my Blog may remember me raving about the Hawksmoor burger, which without a doubt was one of the best things I ate in 2009. I absolutely loved it. The sheer meaty goodness of it set the bar insanely high. Since then, I’ve been keeping a constant eye out for likely contenders to steal its top London burger accolade. 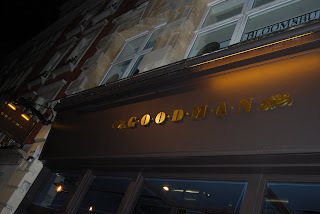 So, it was with some excitement that I arrived at Goodman, the rather superb steak restaurant nestling just a stones throw from Regent Street, to sample their burger. Could it, dare I say it, replace Hawksmoors burger in my affections? Goodman is a meat lover’s paradise, huge slabs of top-notch steak available in seemingly limitless sizes, with the attendant potential of eye watering prices for the truly greedy. It came as no surprise, as I glanced around at my fellow diners, despite the lack of sausage on the menu; there was no doubt at all…. it was a total sausage-fest. I counted three women in the entire restaurant, and they were food bloggers sitting at our table. The rest of the restaurant was populated exclusively by men, wolfing down slabs of meat. The testosterone was so thick; as to be seemingly sliced with one of the wickedly sharp steak knives provided. Enough of the demographics, lets talk about the burgers – the plates arriving at the table certainly looked the part. Fabulous shiny buns (ooer) containing thick, juicy burgers. I’d ordered mine with cheddar cheese and fried onions, which were oozing out from underneath the bun in a rather satisfying manner. I was smitten. Sides of fat chips and Béarnaise were also deposited on the table (I love, love, love Béarnaise – far too much than is good for me). Taking a hefty bite, and straight away getting a taste of beautifully Smokey char-grilled meat, it was superb. A seriously good burger, no denying it, a real contender… As good as the Hawksmoor burger? Opinion among my fellow diners on the table was split fairly evenly. But, for me the Hawksmoor burger edges it. The reason? 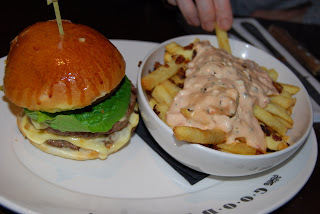 I much prefer the rough, loose, rustic minced texture of Hawksmoor’s burger – the Goodman example was very finely minced, which I just find less appealing for some reason. There’s also the question of produce, Hawksmoors version is packed full of prime UK sourced ingredients – almost re-inventing the classic American burger in a very British way. I like this direction a lot. The Goodman burger is unashamedly American – which is exactly as it should be, I just prefer Hawksmoors take on it. Pricewise, when you factor in accompanying chips, the prices are very similar (Hawksmoors come with fries at £15, the Goodman burger doesn’t, but is £12 – fries are an extra at £3). So, there’s not much in it – but in my mind, right now Hawksmoors superb burger is still the best available in London. As an added bonus on the night, as a result of Chris Pople of Cheese and Biscuits In’N’Out burger campaign. We were privileged to be gifted an example of Goodman’s attempt at replicating it. As with the standard Goodman burger, it was superb. But, again, in my opinion, not quite as good as Hawksmoors effort. The accompanying bowl of ‘Animal Fries’ – frites slathered in Thousand Island dressing, cheese and fried onions were bloody superb…. Although I could literally feel my life shortening as I ate them, I feel they deserve a permanent spot on the menu. I’ve got to add that Goodman treated us extremely well, on top of the In’N’Out burgers to sample, we were also given a brilliant tour of the kitchens in full flow mid-service by the head chef John Cadieux, of who, it has to be said knows his subject - meat, inside out and is utterly fascinating to listen to. So, there you have it. Right now, if you want to eat beautiful steaks or incredible burgers in London – Goodman or Hawksmoor are the two really serious temples to meat eating you should be visiting. Vodka Tasting at Bob Bob Ricard. Among my many fine qualities, (The chiselled looks, the intelligence, the understated yet refined dress sense, the modesty)…. one quality is prized above all others…. it’s not my legendary generosity…. but you could be forgiven for thinking it. No, it’s my superb taste when it comes to alcohol and my subsequent imbibing of said liquid that draws most gasps of admiration* as I stagger and weave my way, through the brash neon glare of many a London evening, hair tousled, shirt tails flapping, eyes unfocused, headed home like a particularly slow, unsteady and dumb guided missile to the refined** shire of Essex…. So, imagine my delight when I received an invite from the rather excellent Soho Institution, Bob Bob Ricard to attend a Vintage Vodka tasting. Delight, yes…. but tinged with a small degree of wariness. A previous delegation of foodie types had attended the same event the previous week and the ensuing carnage was supposedly something to behold… falling over, crawling in gutters, veritable rivers of vomit, tears, talking in tongues…. in addition, counted amongst their number were a infamous Irish drunkard*** and a journalist – so we’re quite patently talking off the chart drunkalism for livers of that calibre to struggle. Arriving at BBR après work, by way of the pub and feeling rather sharp set, having had no time to line my svelte snakelike belly**** with some food to soak up the vodka. My natural apprehensiveness as I stepped through the door, gave way to wide-eyed, mouth agape admiration at the obvious ‘no expense spared’ lustre of the interior. I’ll say this now; Bob Bob Ricard looks utterly superb. A sublime picture of limed oak, marble tiled floors, beautiful lighting, incredibly expensive looking wallpaper and the infamous champagne buttons. Much of it monogrammed with the BBR initials. And that’s before I even set foot in the toilets, which frankly, have to be seen to be believed…. and that’s not something I say often about lavatories. Basically, the whole place looks like it’s been subject to the kind of attention to detail, pride and extravagance that the Victorians delighted in lavishing on their interior design. It’s very nice to see. Shown through to a Private dining room, and greeted by a smiling Bob himself (Or Bob-Bob…. there’s only one Bob despite the name of the restaurant), I took my seat at the table with my fellow diners and sipped on the proffered BBR Signature cocktail of Pink Rhubarb Gin and Tonic, which was gorgeous. A great start. Bob (Now joined at the table by a grinning Ricard) then proceeded to explain a bit about the format of the evening, firstly – after the previous weeks drunken shenanigans…. there would be more food (Yay!! ), but less booze (What?!!). Secondly, it was then explained what makes a good vodka. (Bob being Russian, and therefore somewhat of an expert on the subject). Believe it or not, the purer and hence, less taste the Vodka has, the better it is. The sign of good vodka being how smooth it is with the lack of any discernable aftertaste. Which is quite a strange concept to grasp, especially when drinks manufacturers quite often emphasise wine tasting style attributes (eg: “notes of aniseed and pepper” ) in vodka to appeal to western consumers when these ‘flavours’ are in fact the result of impurities. When it comes to Vodka – less is more. 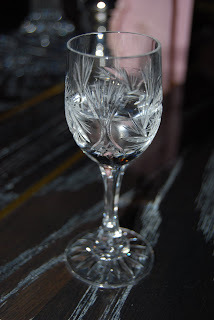 So, with that said – we were treated to out first glass of chilled Vodka…presented in beautiful little crystal glasses, to be drank Russian style with our meal. The trick being to prepare a fork full of grub, down the alcohol in one and immediately eat. The vodka, accentuates the taste of the food. The first Vodka was one of the more expensive of the evening, and in Bobs opinion the best, but in part only because he is a self confessed snob – there being a far cheaper option available (which we’ll come to later) which is pretty good. So – glasses charged with Vodka Kauffman Special Selected Vintage 2006 and the food, a beautifully presented Jellied Ox tongue with creamed Horseradish poised on forks…. down the hatch it went, swiftly followed by the food. Superb…. 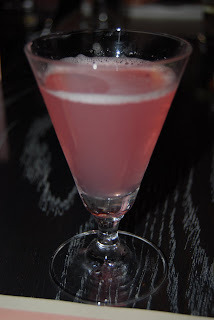 it surprised me how smooth the vodka was and how good the food tasted following it – downing spirits combined with eating being quite an alien concept to me…. I could get used to this. 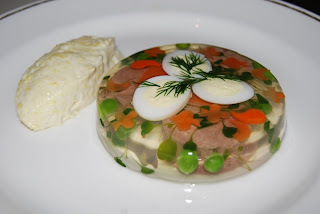 By the way, The Ox tongue in aspic dish was beautiful, old school Edwardian style – I’ve never seen the like on a menu in London before. 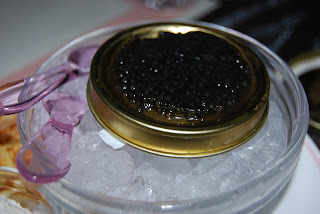 Next up came caviar, blinis and sour cream…. a tin each, served on ice and our glasses were filled with Vodka Kauffman Private collection luxury vintage 2003. Bob encouraged us to deposit about half a tin on single blini, with a dab of sour cream before once again shooting the vodka and immediately following with the food. To be honest, I’ve only really tried caviar once before and despite it being quite pleasant – I can’t see what the appeal is, when you consider cost versus taste. Perhaps my palette just isn’t that refined. But seeing as I wasn’t paying for this, I put all thoughts of cost from my mind and enjoyed. The Vodka once again being very smooth, and working well with the food, but I think I preferred the previous choice. Next – a food Intermission, designed to soak up some of the alcohol we’d consumed. Bob and Ricard still being extremely anxious not to repeat the fallout from the previous tasting. 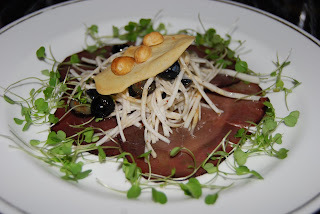 Wafer-thin cured Orkney Beef with a crunchy celeriac salad, fresh blueberries and roasted hazelnuts. 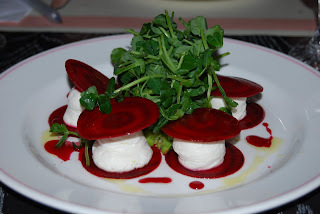 Wafer-thin pickled beetroot and goats cheese salad with fresh mint. 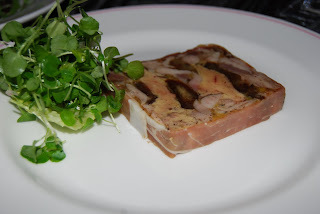 And finally, Rabbit, Foie Gras and date terrine. 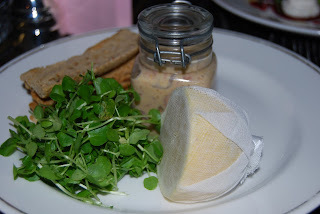 All of the food was delicious and beautifully presented, but in particular I found the Rabbit terrine and the goats cheese/beetroot dish rather good. 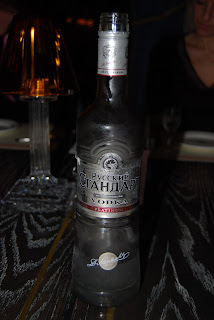 Plates cleared, next we were served Russian Standard Platinum Vodka – which retails for around £18 a bottle…. keep that thought in your mind when I tell you….I preferred It to the £160 a bottle which we sampled in our first taste. The food we were to eat with this would be a traditional dish of Russian salt-cured herring, raw onion rings and new potatoes. 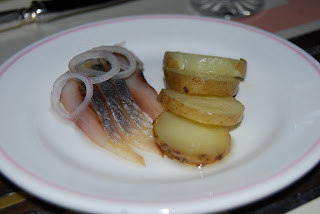 The knack here being to down the vodka, eat the herring and onion, and then follow it all up with a potato to neutralise the saltiness. Beautiful - I really liked this vodka and it worked extremely well with the food. 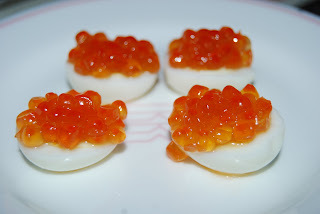 Imperium, by Russian Standard was the next proffered vodka, this time served with Salmon roe on hard-boiled quails eggs. I wasn’t massively keen on the salmon roe here but the Vodka was again very good, smooth and with no real aftertaste. More quails eggs to accompany our taste of Beluga Vodka. This time served with mayonnaise and anchovies, which I loved. They seemed to work with the vodka so well. At this point, I cheekily started to ask Bob for second shots of Vodka, which he graciously agreed to as long as we didn’t start rolling around under the table etc. Things started to get a little bit livelier from this point onwards, but in a good way. The next vodka we were offered was Vodka Beluga Gold Line, apparently only 900 bottles of it are produced a day, so pretty expensive. This was served with Meat Pelmeni, which were delicious. 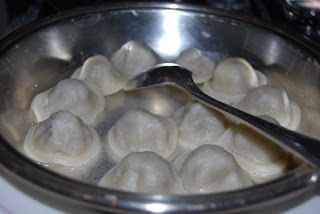 I can only describe them as being like a Russian version of Dim Sum. The Vodka was good, but not as nice as my favourite from earlier in the evening. Bob had saved the two worst examples for last, being contemptuous of Stolichnaya – these were the premium examples of the brand, Gold and Vodka Elite – both retailing at nearly £100 a bottle. As predicted they were both abysmal, rough tasting with a long bitter aftertaste – nothing like the quality of any of the other vodkas we had tried previously that evening. 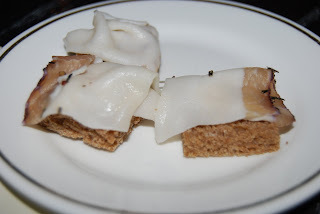 Happily, the food we were served alongside the booze, Salo on rye bread (cured pork fat) and Malosol Cucumber was delightful. 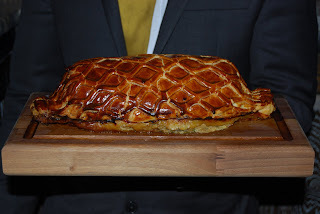 As a finale to a really memorable evening a superb looking Beef Wellington was brought out and served with truffle gravy and vegetables. Followed by desserts and coffee. Full, and more than a little unsteady….I staggered off into the dark London night, my vodka addled brain slowly coming to the conclusion that I’d learnt a few interesting things that evening. Russian food, when cooked well is really rather good. The combination of food and vodka, in particular the taste enhancing effect with small forkfuls eaten in the Russian manner after downing a shot is really interesting. If you ever get the chance to try it, do. Pricier doesn’t necessarily mean better – Russian Standard Platinum costing almost ten times less than some of the vodkas we drank that evening was one of my favourites (and is also, a bit of a favourite with the residents of Russia as well apparently) – if you’re going to buy Vodka, I urge you to forget about the dubious pleasures of Smirnoff or Absolut and try Russian Standard Platinum instead, it’ll be revelation, I promise. Finally, I’d like to thank Bob and Ricard for being such extremely generous hosts. I had a wonderful evening, truly first class. *** It’s true I tell you.